What's an antonym for “protrude”? Say there’s an embossed star in a wall (a). 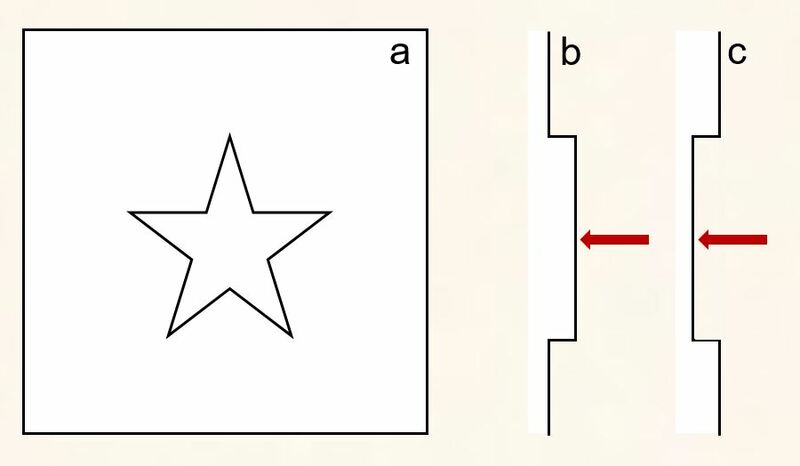 If the star’s surface is closer to the viewer than the wall’s surface (b), you can say the star is protruding. Similarly, if the star’s surface is farther from the viewer than the wall’s surface (c), you can say the star is ____. Looking for antonyms of “protrude” hasn’t been much helpful. The position of the light source and the shade it casts is what determines in most cases if the star is perceived as protruding or as ______. The closest I got is "carved in the wall", but that's not quite it. Also, the etymological opposite of protrude seems to be intrude, but I don't think "the star is intruding" makes sense. I’m looking for a verb, but adjectives or adverbs would be appreciated too, as long as I can rephrase the sentence so it conveys the meaning I’m after. You could go with indented. Indent: make a dent or impression in (something). Deboss: stamp (a design) into the surface of an object so that it is indented. I think of the verb sink or the adjective sunken. At a lower level than the surrounding area. While the auditorium's revolving stage remained, the portal arch was transformed into arched bridges to sunken, unroofed parking areas. I have a strange answer: impress. In the world of architectural design, I've learned the word "extrude" for 'pulling' a subset of a face out, embossing that subset. I think of that as the opposite of engrave. Of course, metaphorically, to leave an impression on someone means to make a mark on them. Accordingly: I really like the extrude/impress dichotomy. Similarly, protrude and indent are conceptual antonyms. Although if you want to conform to conventional usage, these particular options might not be properly understood. It works better (in my opinion) for text than for the star example, but you could say it had been engraved into the wall. I would have said there was another option: "etched"; but apparently that only applies if chemicals are used for the cutting, rather than an implement. The position of the light source and the shade it casts is what determines in most cases if the star is perceived as protruding or as receding. Another option would be to say that the star is "depressed" into the wall. Consider Intaglio that refers to techniques in art in which an image is created by cutting, carving or engraving into a flat surface and may also refer to objects made using these technique. Figure b illustrates a "bas-relief" and the star in figure c, that was "incised in intaglio", is now "displayed in intaglio". EDIT: @hugh - After reading the comments, I realized that you already proposed this word. I will delete this answer, if you create one. I think incised would also be an option. What's the antonym for 'word'? What's the antonym for Schadenfreude? What's the antonym of “serendipitous”? What's an antonym to “legacy”? What's the antonym of “buy-in”? What's the term for an antonym of a continuum? What's a good antonym for the word serendipity? What's an antonym for the adjective “concrete”?